Our Craftsmanship Standards is a series of articles that take you behind the scenes of Paperblanks. Quality is the single most important part of the design process of our books. We attend to each detail and apply rigorous quality control checks to every component of our journals. At Paperblanks, we adhere to classic book craft and tradition. For those who love the classic book arts, our blank journals are bound with either smythe sewing or handstitching techniques. 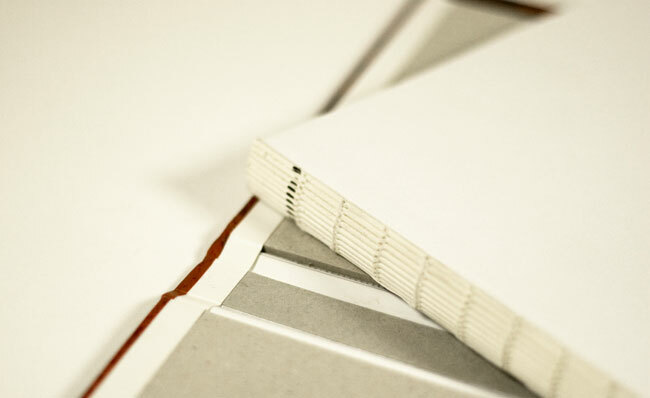 In the classic art of bookmaking, the sewing together of signatures (paper folded into groups of 8, 16, or 32 pages) is at the heart of a well-made book. 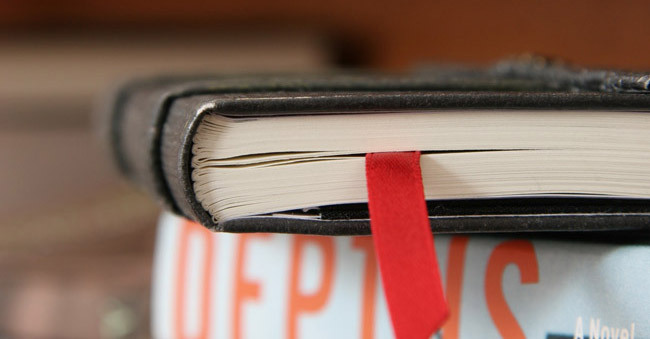 Following this classic tradition, we sew our signatures together to create our book blocks and we never glue our book blocks directly to the spine of the cover. Our books open flatter as a result and are also more sturdily constructed. Your book will stay together as long as you need, and our pages will never fall out or come loose. We call our books smythe sewn to give credit where credit is due, and out of respect for David McConnell Smyth, the inventor who, a century ago, devised a way to sew book signatures together using a machine rather than by hand. Recognized as the pioneer of modern day machine bookbinding, Smyth’s method to gather signatures and sew them together created a high quality, durable book that has yet to be surpassed. Prior to the invention of machine book sewing by Smyth in 1879, all books were sewn by hand, one folded signature section after the other. Bound by the smythe sewn method, our books will withstand the ravages of time. A range of our writing journals are handstitched to ensure that the pages lie perfectly flat: a sure sign of fine handcrafted bookmaking at work. Coptic handstitching first evolved in the 2nd century and remains one of the most beautiful and durable forms of book binding today. The covers are held together with a chain or Coptic stitch, named after the Christian Copts of Egypt who used this stitch to bind together their folded parchment manuscripts. Each of the blank books in our handstitched collections represent the quality and timelessness imbued in this ancient craft. With these books you can delight in a truly well-crafted, handmade object. Our Handstitched Collections include: Zen, Tao, Mystic Calligraphy, The Book of Kells, Tiffany Leaded Glass. I just wrote you a separate e-mail about the “Tiffany” (Leaded Glass) collection, and an hour later, I did a search function on your website (which is addictive by the way, and in a GOOD way!) and came to this page with all 4 “Tiffany” books from 2006. 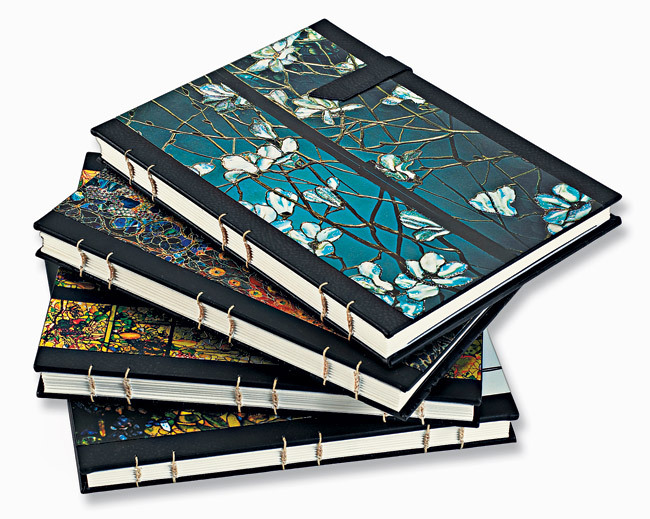 From the cover designs to the Coptic stitching to the sleek magnetic closure, these were just beautiful. The size, the lined paper, plus all the preceding, made them an extra-special journal / keepsake book. Any chance of bringing them back, or doing another series of different Tiffany images? I think you would have tremendous response, especially if available, as the ’06 line was, for the holidays. Just a thought — and a wish / hope! You make beautiful products. Thank you!! We saw your other note and left you a longer response there. We really appreciate your feedback and are pleased to hear that the Tiffany Leaded Glass continues to be appreciated. It is definitely one of our most treasured collections. We will pass along your feedback!